After the successful but disastrous raid on Mount Weather, he is facing the impossible. Katy is gone. Taken. everything becomes about finding her. Taking out anyone who stands in his way? Done. Burning down the whole world to save her? Gladly. Exposing his alien race to the world? With pleasure. Surrounded by enemies, the only way she can come out of this is to adapt. After all, there are sides to Daedalus that don't seem entirely crazy, but the group's goals are frightening and the truths they speak even more disturbing. Who are the real bad guys? Daedalus? Mankind? Or the Luxen? OH.MY.GAWDDD!!!!!!!!!!!! This book was insane. I have been waiting months for this to come out and I was not disappointed one bit. What more could you want in a book. Alien love, crazed government officials, tanks, betrayal, and of course more alien love lol. Something that was different in this book was the split POV between Daemon and Katy. At first I was a little leery of how that was going to work but i think that it actually added to the story and there really was no other way to convey everything that was happening just from Katy's perspective. With this being the first book where we get to hear from Daemon I wasn't sure what to expect. His personality from Katy's POV has always been super sarcastic, and wow does that boy have a huge ego! And surprise surprise those personality traits are like that in his head too. It was a great change and I'm so happy Armentrout decided to take this turn with the book. Ok so one of the things that always stands out in all of Armentrout's books is her sense of humor. I have yet to read a book she has wrote that didn't have me smiling or cracking up. And let me tell you, that can be a really bad thing when your in public and just start laughing out of no where. Take it from me I have gotten some looks, even my mother has given me the "you are crazy" look a few times, and she knows how I get with my books. Well origin did not disappoint. You all will love the sarcastic remarks, and quick whit that flows between Katy and Daemon even when they are facing some of the hardest decisions of their lives. Let me give you fair warning right now, this book was pretty intense. Some of the things that went down had me wiggling around in my chair and usually that kinda stuff doesn't really effect me. If there was a way to reach inside a book and strangle some people I'm pretty sure I would have wrung a few necks. Armentrout offers just enough intensity to keep you on your toes while still giving you a chance to breath, well that is until the last few chapters. WARNING! You are in for a huge shock on multiple levels. And some of them are some pretty suckish shocks. Ok so something that I really don't want to give to much info on but want to talk about it the title of the book. I wasn't sure where in the heck the name came from but when it was finally explained I was shocked. It is really a game changer for the book and I am so interested how this will play into the fifth and final book along with the events that ended the book. As Daemon would say to this "Well aren't you a special snow flake" Ok so not to tell you too much, but be prepared because a new player is being added to the playing field and I am almost 100% for sure that this is not going to be a friendly player. More of the take over the world, were better than you type of player. And where will Katy and Daemon stand is pretty well unknown. Even them being together is going to be unknown. I hate suspense and this book has left me with a whole lot of it. I have to admit I am having a hard time with this review. I don't want to give any spoilers away because I know how frustrating that is to read a review and then know whats going to happen in a book. And i feel like to not give anything away I really don't have a lot more to say. I guess over all, I can say that this book is amazing and will leave you begging for it to be summer 2014 already. I would definitely suggest you go out and buy a copy today. I for sure give this book 5 stars and will be posting any and everything I hear in the coming months for the fifth book Opposition. Oh and just a small note to readers. Jennifer writes under another name, J Lynn and those books are more the bow chic a wow wow kinda books. But she one called obsession and if you would like to understand the world of the Lux from a very different perspective and to get filled in on a few things in Origin I would suggest reading the book as well. But like I said before the book Is definitely a 18+ book and may not be appropriate for the younger kids who read Lux books. 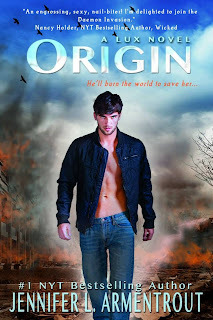 But if you like a steamy romance and would like a bit more info go read it, it helped me understand some things when I finally got my hands on Origin.